Hhmm ..... The problem I have found Gary is that the series comes accross a bit too rushed. Also, Marvel now have a really annoying habit of declaring someone is going to die (meaning a lead character) during practically every story. 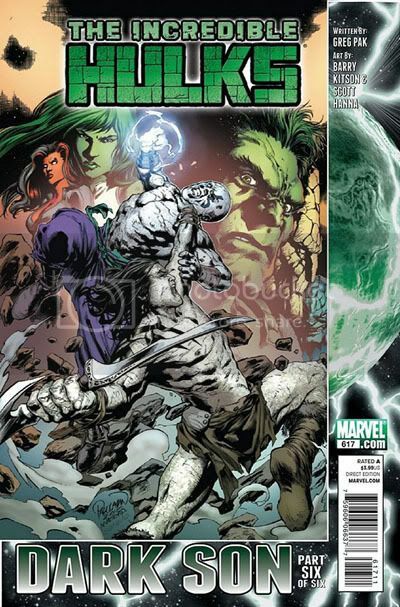 In fact, Skaar did 'die' only to comeback using his powers. Hiro Kala (like Romulus in the Wolverine title before him) gets contained for now. I do hope that Marvel continue in their quest in making him this generations version of Thanos before the character finds redemption and becomes a hero. The thing I find irritating is that his claim, to me is now a little bit weaker in being Hulk's son due to the fact that the conversation he had with his mother turns out to be a creation of his own mind to deal with the guilt of killing billions of innocent people. Though I can learn to live with it. Anyway, get you get the email I sent you recently? PS Any news on when you will be interviewing Greg Pak? Do review The Savage She-Hulks title when you can. It is very good! Your opinion would be invaluable to me and countless others!